IDENTIFY THE DOCTRINE (discussing scriptures): Show a picture of Jesus Christ in Gethsemane, and briefly review the Atonement (see Luke 22:39–44). Invite someone to read Doctrine and Covenants 19:16, and ask the children to listen for what they must do to enjoy the blessings of the Atonement. I have some great ideas to share with all of you today. I have some of my own ideas and some great ideas from others. ABC’s of RepentanceTeach the children about repentance by using the ABC’s of repentance. You’ll open with an object lesson and then discuss the steps of repentance.Click HERE to see the ABC’s of Repentance Sharing Time Idea. Sharing Time Idea from Latter-Day Chatter There is a great Sharing Time available over at Latter-Day Chatter. You’ll be comparing sins and repentance to rocks in your shoes. This is an idea that the kids will love!Click HERE to visit Latter-Day Chatter. Don’t Take the BaitHere’s another great idea that your Primary will love. This idea comes from Sugardoodle (shared by Jeanette Binns).For this sharing time you will be comparing sin and repentance to fishing, bait, and lures. Click HERE to visit Sugardoodle. 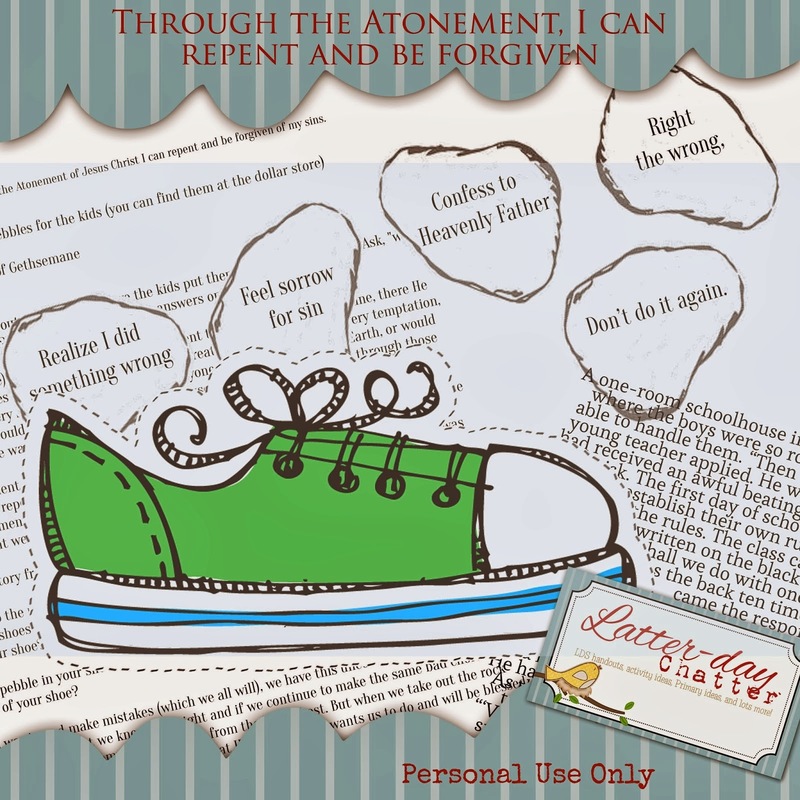 I have other ideas that I have shared in the past.Click HERE to view all of my Sharing Time ideas on The Atonement,and Click HERE for some other Sharing Time ideas on Repentance.